Sásta roughly translates to ‘happy’ in Gaelic and that’s how the performance by one of Australia’s most dynamic Irish bands will make you feel. 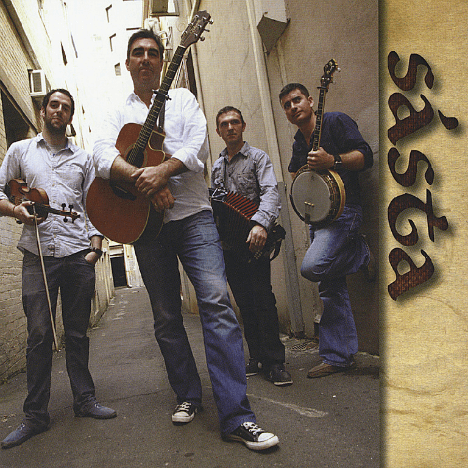 Sásta Band has already made a huge impact on the Irish music scene in Australia in recent times and continues to grow in popularity. The band is made up of multi-instrumentalists Joe Murray (fiddle), Tommy Donovan (banjo, mandolin), Rocky Towey (accordion) and Micheál Hughes (vocals/guitar), who have all performed at the highest national level. Their tunes are influenced by the likes of The Barleyshakes,The Pogues, The Biblecode Sundays, The Dubliners, Finbar Furey, Kila, Luka Bloom, The Waterboys, Christy and many more. Sásta recently released their debut CD and have supported international rock acts such as ‘Aslan’, also Shane McGowan’s band ‘The Popes’ (formerly The Pogues), as well as performing at many festivals around the country including the National Folk Festival in Canberra and Woodford Folk Festival. Pumping reels with phenomenal energy, they’ll bring you all of your favourite Irish songs, as well as some superbly penned original tunes and songs that will have you up and dancing in no time!